Hotel Splendid in Becici is arguably one of the best hotels in Montenegro. But is it truly worthy of its 5 star rating? Let's find out. If you’ve been dreaming of a resort holiday with cocktails by the pool, spa treatments, the beach on your doorstep and plenty of things to do, Hotel Splendid Conference and Spa Resort is the first place you should look. But it’s not perfect and there are a few things you should know before you book. It’s labelled as a 5 star resort, and is one of the best you’ll find in Montenegro, but in reality it would be a 4 star + by western standards. Little issues with the rooms and service keep it from being a true 5 star resort. 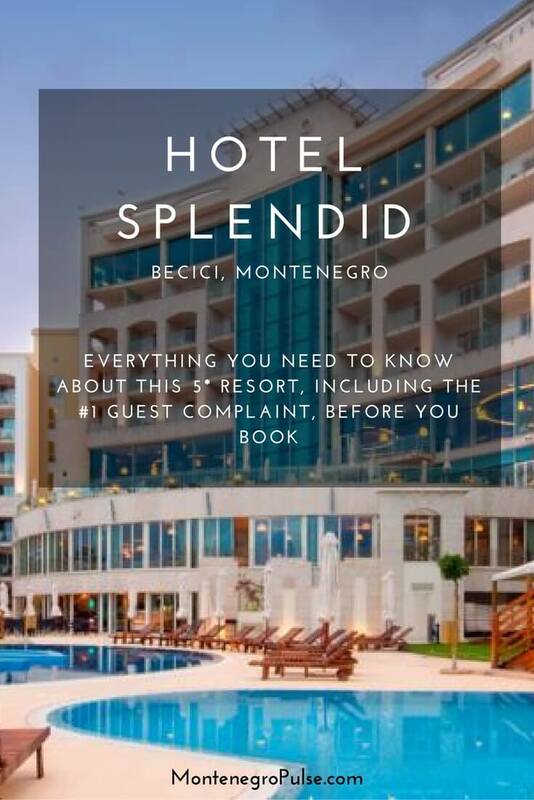 But if you arrive without 5 star expectations, and I always recommend people keep in mind that Montenegro is an emerging destination (not a polished, experienced one) you could have a very enjoyable holiday in Hotel Splendid. 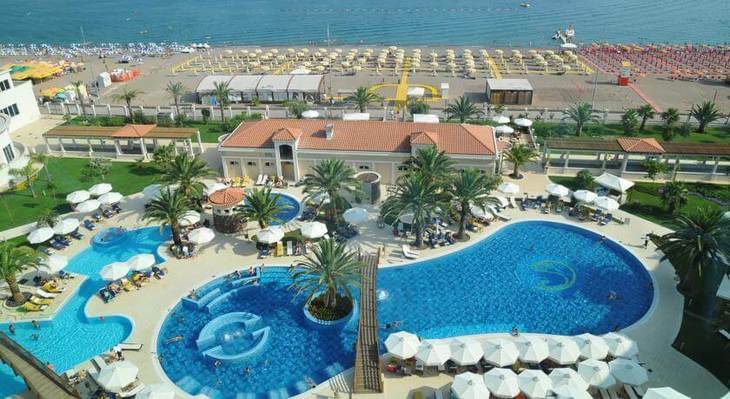 Hotel Splendid is in Becici, on the Budva Riviera. It’s only 3km to Budva centre so it’s easy to drive, walk or catch a taxi to town. Budva is known for being very hectic and busy in July and August, which might put you off. While you would have to put up with lots of traffic in peak season, Becici is far enough from Budva that you don’t have the 24/7 beach parties and can enjoy a reasonably relaxing atmosphere. Outside of July and August, the whole Riviera is much more relaxed and easy to get around. It’s also easy to get to any of the other most popular destinations in Montenegro, like Kotor, Perast, Sveti Stefan, Lake Skadar, Cetinje, Bar and Ulcinj. 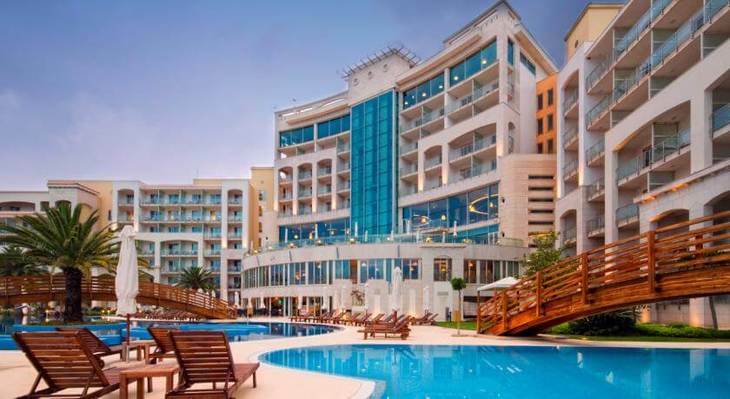 Hotel Splendid is the biggest hotel in Montenegro. It’s got 322 rooms, 4 suites, 13 apartments, a penthouse suite and a presidential suite. 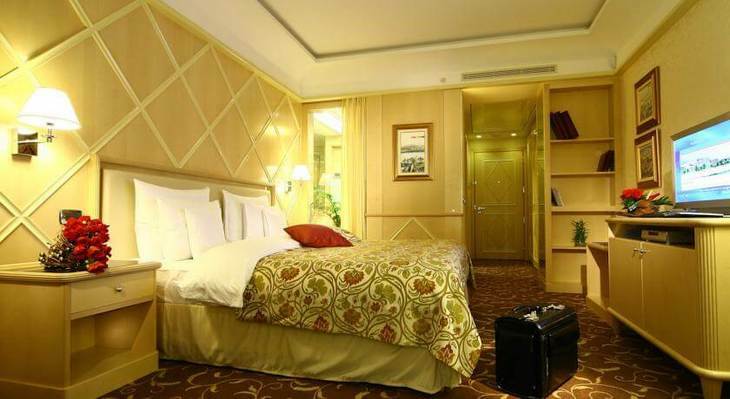 When you book a room, you have the choice of mountain view, pool view, sea view and premium sea view rooms. Of course, I recommend getting a room with a sea view because you’re staying on the beach and the Budva Riviera sunsets are truly magnificent. But if you’re on a budget, you can always book a mountain view or pool view room and enjoy the sunset from a waterfront restaurant or the beach itself. Originally the rooms had glass walls separating the bedroom and bathroom (not sure who thought that was a good idea!) but it was understandably unpopular and they changed it. 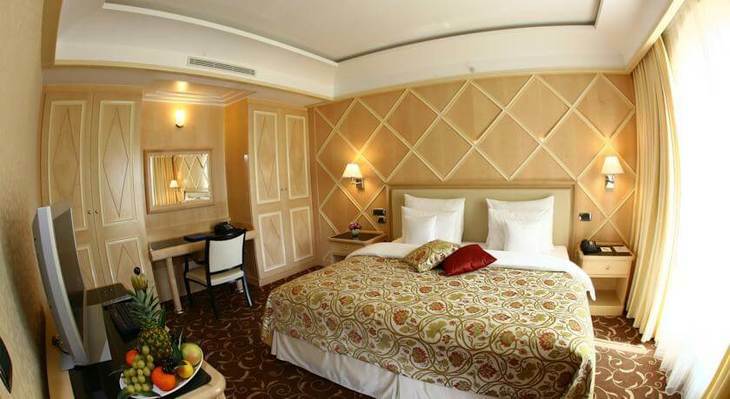 The standard rooms are all 42 square metres and the suites are 54 or 84 square metres. One of the stand out benefits of staying at Hotel Splendid is the pools. 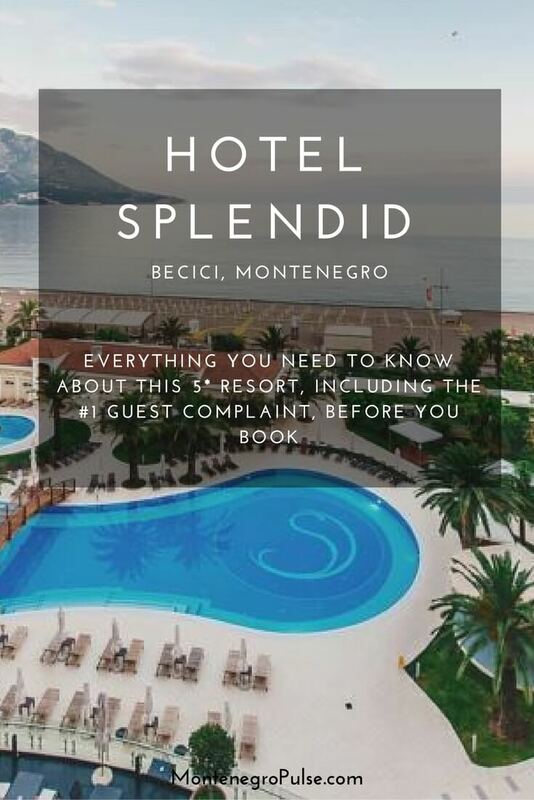 No other hotel in Montenegro offers large outdoor pools and jacuzzis like the ones at Hotel Splendid. Add to that the three indoor pools for cooler weather and you’ve got a very attractive reason to stay here. If you’ve got kids, you’ll know that they can happily spend entire days splashing in the pool while you catch up on some reading on a lounger. Like most hotels in Montenegro, a buffet breakfast is included with your stay. There are also three la carte restaurants and two bars in the hotel. Beside the pools, there are two bars where you can get drinks, desserts and light meals like sandwiches and fries. The price of food and drinks in the hotel is very high compared to local prices and it’s not outstanding. There are better and more reasonably priced options in Budva and all along the coast. See our Budva restaurant guide for recommendations. Guests are banned from bringing in any food or drinks from outside. You can easily head out and find reasonably-priced restaurants and cafes near-by, but it’s annoying to either pay an exorbitant amount for a bottle of water or go out and get one every time you’re thirsty. This is the most common guest complaint and it’s not surprising when they book a 5 star hotel and then have to open their bags so security can check for hidden food and drinks every time they come in. You shouldn’t feel like a criminal over a bottle of water when you’re paying almost €200 a night. The hotel has a full spa with indoor pools, various saunas, steam rooms, relaxation rooms, showers, gym, massages and beauty treatments. As a guest you get free use of the wellness facilities and pay for individual treatments. If you’re not staying at the hotel you can still use the wellness facilities for €20 plus the standard pricing for individual services. The hotel has a casino, petanque, beach volleyball and tennis courts. It also has a kids’ play area with toys and activities like face painting and chess. Becici beach is a long cove separated from Budva’s main beach, Slovenska Plaza, by Zavala Cape (the site of Dukley Gardens). Hotel Splendid has a dedicated area on the beach with loungers for hotel guests. You’ll also find lots of pedal boats, parasailing and jet skis that you can hire. The beach is a mixture small pebbles and sand which gradually slopes into the sea. It’s calm, great for kids and hovers around 23-26 C (73-79 F) in summer. 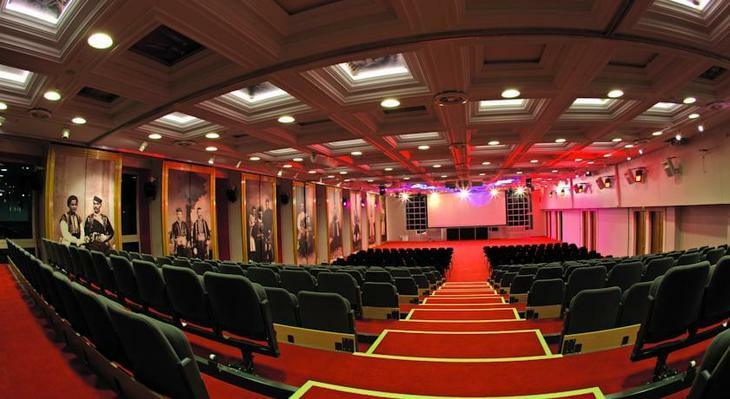 Hotel Splendid can accommodate conferences, weddings and special events for up to 800 people. If you’re interested in hosting an event you can contact them at events@montenegrostars.com.